With Alpha Chi Omega, you get an organization built by and for real, strong women. Alpha Chi Omega was founded on October 15, 1885 at DePauw University in Greencastle, Indiana. That's about 70 miles southwest of our current headquarters in Indianapolis. 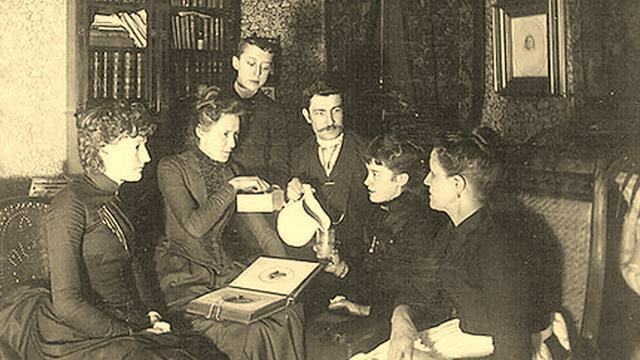 Back when America was getting used to the notion that women belonged in college at all, the dean of DePauw's School of Music, Professor James Hamilton Howe, invited seven of his female students to form a women's society within the school. Our founders took Professor Howe's suggestion a step further and formed a women's fraternity, only the sixth of its kind in the country. They were the first such group in the music school and believed they'd be the last. So they chose as their name the first and last letters of the Greek alphabet - Alpha and Omega. They put the word "Kai" (and) in the middle, and later changed it to the Greek letter Chi. Our founders wanted Alpha Chi Omega to advance "the intellectual, social and moral culture" of its members. It worked. Today, our women's Fraternity, the Alpha Chi Omega Foundtion and our National Housing Corporation serve more than 200,000 members in more than 130 collegiate chapters and 200 alumnae chapter nationwide. The real, strong women who founded Alpha Chi Omega were music students at DePauw University in Greencastle, Indiana. As musicians, our founders included three pianist, a cellis/violinist/bassist, a composer and two singers. As collegians, they sough "friendship, artistic society and advancement of the 'principles of true womanhood'." Interested in music from early childhood, Anna was the youngest students to do advanced work at DePauw's School of Music, graduating at the age of 19. Anna was an accompanist, performer and teacher in the school for 10 years. She lived in Greencastle all her life, and the first Alpha Chi Omega convention took place at her home. Olive (called "Ollie" by her friends) studied piano, violin, cello and double bass. She taught at DePauw for two years while carrying on her studies. In her junior year, she left school to take teaching positions in Anderson and Franklin, Indiana. "I have found no greater happiness in my life than Alpha Chi Omega," she said later in life. "All I have ventured to give toward the upbuilding of our fraternity has been from the depths of my hear, and has been repaid in thousand-fold by my girls." When Bertha's parents decided their musically advanced daughter should continue her studies at DePauw, she had to play for Dan Howe to determine just how advanced she was. She went on to become the envy of the school's music students because of her composing skills. She also was an accomplished performer and successful teacher in the School of Music for 10 years. Hers is the only one of five original badges that exists today. It's on display at Alpha Chi Omega Headquarters. Amy was only 15 when she entered DePauw. She studied both voice and pianoforte. She was know as "the little girl with the big voice," and was selected to sing important roles in school productions. Amy had a quiet and straightforward manner, which belied her fondness for pulling pranks on her fraternity sisters. Her influence on the fraternity endured long after she left to teach in Kansas. Nellie studied piano from an early age and, after much deliberation, chose DePauw. She was described variously by her sisters as being gentle, energetic, earnest and friendly, leading a life of "quiet influence for good." Later in life, she cultivated roses and loved to garden. She said that Alpha Chi Omega had a small beginning, but was built by loyal women with high standards who have achieved "marvelous results." Bessie began studying music as a young child and was an accomplished pianist by the time she entered DePauw. Near the end of her first year there, she strained the muscles of her left hand from over-practice and had to give up the ambition of her life. However, she gave much of her time to help build Alpha Chi Omega. Her daughter, Hannah, eventually became director of Alpha Chi's central office, later known as headquaters. Estelle entered DePauw hoping to make a living as a musician. Most of her time was spent practicing or studying. She also served as Dean Howe's secretary for two years. Through she had serious goals and a "dignified appearance," she was known for playing practical jokes on her colleagues. She graduated in 1891 and had a full career, teaching music, publishing piano compositions, and reporting for the local newspaper. Long involved with Alpha Chi Omega, she attended more conventions than any other founder. She was described in our 1948 history as "distinctly mondern in her ideas" and as having "developed independence, decision, and a rather bohemian attitude."